We do different types of testing to accomplish different goals. Your team has its own unique context. It’s a tool, not a rule. Drives development to deliver the requested business value. Safety net to prevent silent regressions. Units tests verify functionality of a small subset of the system (object/method). Component tests verify a larger part, as a group of classes that provide a service. These tests are automated and written in the same programming language as the application (dev team only). Define external quality and the features the customers want. Drive dev team at a higher level. Tests are derived from examples, provided by the customer team. Each test verifies a business satisfaction condiction (readable by the customer team). Testers use their senses and intuition to check if the team has delivered the value required, “what the customer really wants”. Users and customers perform these tests, in order to approve finished stories. Gathering their reactions an knowledge of how they use the systems is an advantage. 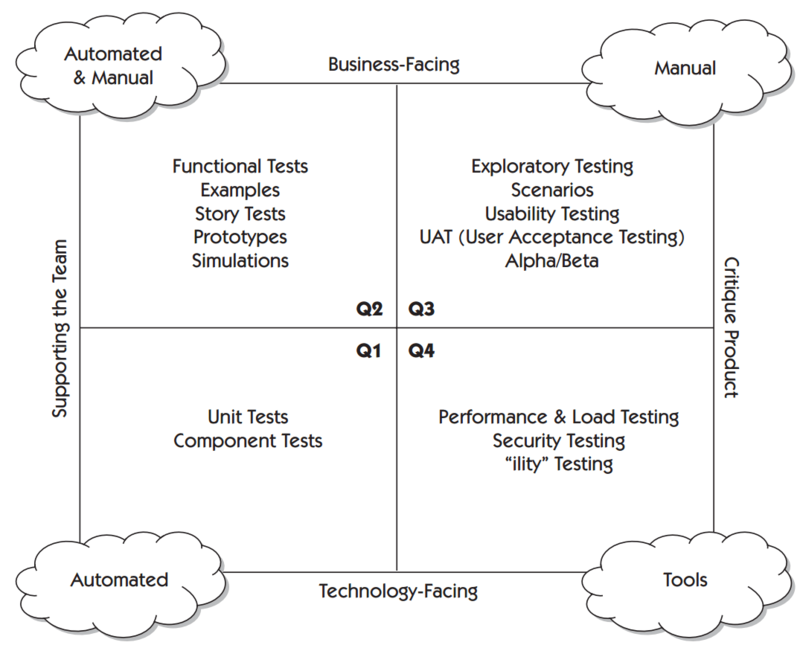 In exploratory testing, the tester simultaneously designs and performs tests. It’s not ad hoc testing, it’s guided by a strategy, creativity and intuition with defined constraints. From the start, testers start thinking of scenarios they want to try, as end users will. For some cases they might be more important than actual functionality. Example: if application performance is critical, plan to test with production-level loads as soon as testable code is available. Make sure all necessary testing is done at the right time. Example: if you find out too late that your design doesn’t scale, start load testing earlier next time. This quadrant provides feedback to the left side of the matrix. Use lightweight tools to create test data and set up scenarios.